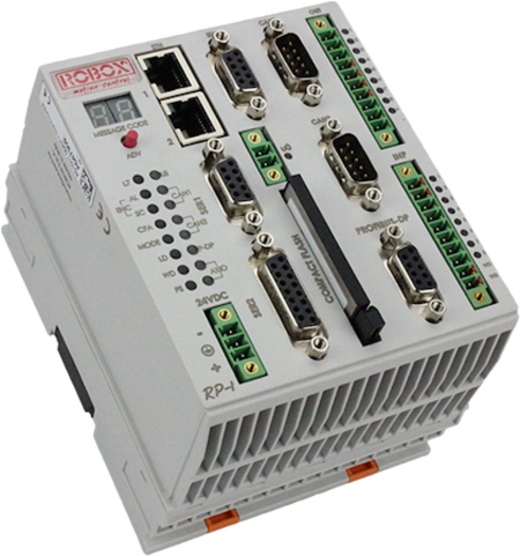 Robox designes and manufactures a family of motion controllers for robots, machine tools, flexible machines. These controllers are applied in a variety of fields: robotics, paper industry, glass industry, marble industry, wood industry, food industry, packaging, textile industry, fibre optic handling, printing machines, etc. A CANopen interface allows communication of these controllers with remote devices. As slave they can be interfaced through the Device Net protocol. The powerful RDE tool (Robox Development Environment) allows the user to easily describe the net, while the Robox R3 programming language allows to quickly build the desired motion laws for gearings and cams. Teleservicing and on-line debug tools are available as well. control of up to 2048 digitali inputs, 2048 digital outputs, 128 analog inputs, 128 analog outputs.